If you’re looking for a high-traffic and low life-cycle flooring option, carpet tile may be just what you need. Available in a variety of patterns, colors, and styles, carpet tile can withstand heavy foot traffic and maintain their beauty for decades. Michael’s Floor Covering is the Fort Wayne, IN’s premier source for flooring, including high-quality carpet tile. Stop by our store in Fort Wayne, IN to see our large variety of carpet tile flooring samples, and enjoy a free consultation with one of our flooring experts. We’re looking forward to serving you! 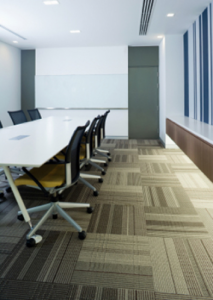 Carpet tile in a commercial application has many benefits, including style, ease of maintenance, ease of installation and maintenance, and low life-cycle costs. Modular carpet tiles consist normally of bonded carpet cut in squares. Modular carpet tile (or “carpet squares”) normally comes in one size: 18 x l8 inches. Varying thickness’ and patterns are available, as well as hundreds of different colors. Carpet tile is a fashionable product that adds warmth to any commercial facility, thus reducing an institutional feel. Borders and accents can easily be specified to define different areas of an interior space. Insets can also be added for borders, captivating designs or for directional purposes. Carpet tile’s main advantage is that you can replace a damaged or worn area without having to replace the whole carpet. Modular carpet tiles located underneath furniture, for example, can be replaced with those in high-traffic area to even out wear. They also allow easy access to under-floor wiring or plumbing. Extra replacement tiles should be purchased with the main batch, as those brought at a later date will almost certainly be slightly different color. Modular carpet tile turns the messy, awkward job of carpet installation into a quick and easy one. Placement requires less time and few special tools. This type of flooring can be chosen for any room. Using carpet tile saves time when installing and replacing. For example, all the furniture does not have to be removed from a room to install or replace carpet tiles; you simply move the furniture from one end to the other. If you’re installing traditional broadloom carpeting, you have to clear the room and do a lot of prep work. Carpet tile can be purchased either dry-backed or self-sticking. The dry-backed version needs a special adhesive or, for less permanent jobs, double-faced tape. These can go over almost any surface, as long as it is clean and dry. However, it is not highly recommended for use in below-ground areas, such as a basement, because it could mildew. If an area of the carpet becomes stained, burned or worn looking, all you have to do is pull up those squares and replace them, as opposed to replacing the entire area. Most recently, with the larger-scale patterns that are available, you can install one dye lot and, two years later, you can put another dye lot right beside it. That’s a big advantage because it means you don’t have to keep attic stock on hand. Modular carpet’s ease of maintenance and ease of installation and replacement add up to low life-cycle costs. But other factors contribute to this benefit, too. Modular carpet tiles are generally very rugged and handles well in high-traffic areas. Modular carpet tile are produced with a heavy backing, which serves as a cushion that absorbs the wear of the face fibers and prevents their premature loss. Yet another factor is less waste. If you have an 8-ft, corridor, and you’re installing 12-ft. broadloom, you have four feet of waste. With carpet tile, you may only have to cut a small portion off a small percentage of tiles to fit the same area. Traditionally, carpet tiles are a little more expensive than broadloom upfront because of the backing and the cutting process. But because of the heaviness of the backing and the type of construction, you get a longer wear cycle out of the carpet tile. To get the most out of your carpet tile investment, consult a flooring installation company to skillfully measure, and install your new carpet tile floor. To learn more about how carpet tile flooring can work for your project, contact the flooring experts at Michael’s Floor Covering or stop by our showroom in Fort Wayne, IN for a free consultation!